To celebrate that there are just ten days till spring the Atlantic Maintenance Group is here with five ways to prepare your landscape for spring. Pruning, edging, mulching, fertilizing and planting all help beautify your yard and bump up your curb appeal. So get ready to say goodbye to snow and the winter blues and greet the colors and warm weather of spring with open arms. Pruning is essential to prepare your landscape for spring. Pruning just before spring or during early spring provides the best results for your trees and shrubs. Pruning as we mentioned in an earlier blog, improves your trees’ health and removes dangerous limbs, as well as helping to shape it into a more pleasing shape. Pruning your bushes can help revitalize them in spring and keeps their size and shape under control which is essential for keeping up your curb appeal. If you want to prepare your landscape for spring, edging is a must. Edging helps to define the line between your landscaping and lawn. Edging will prevent your grass from growing into your beds, and keep them both looking neater. Clean edging will give your landscape a sharp and well manicured appearance. Mulching can improve the health of your plants and keeps your landscaping looking fresh. Mulching improves plant health by helping to control moisture absorption by the plants and by preventing weeds. Mulch helps moisture control by absorbing water from heavy rains and releasing it over time. Mulch prevents weeds from growing by keeping them covered and weighted down. TO mulch properly you should pull off your fall mulch. Before you apply the spring mulch it’s important until your plants have started to come up, that way you know where they are and don’t cover them and prevent them from growing. For these reasons mulching is an important factor when you prepare your landscape for spring. Fertilizing your grass is key to prepare your landscape for spring. Fertilizing gives your grass nutrients to grow strong and healthy. You should fertilize shortly after or before a light rain if you can. If there’s no rain in the forecast you can water your grass, wait two days for he water to be absorbed, and then fertilize and follow up with a light watering. When you fertilize you can also apply pre-emergent herbicide. Pre-emergent herbicide prevents crabgrass and other weeds, but be careful, it works by stopping all seeds from germinating. So if you’re seeding your grass don’t apply pre-emergent herbicide, and be careful about spreading it around your flower beds. Spring is the perfect time to plant. When the ground has thawed and is easy to work you can plant to your hearts content and really prepare your landscape for spring by planting beautiful annuals and perennials. 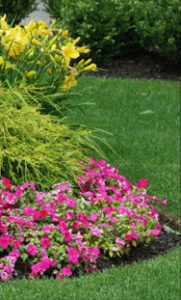 If you want to prepare your landscape for spring, call the Atlantic Maintenance Group. The Atlantic Maintenance Group is a full service landscaping company, providing maintenance, design and construction, as well as snow removal, asphalt and concrete services. To get your free quote today, give us a call at 410-768-4720 or contact us via our website today. You can also follow us on Facebook, Twitter, Pinterest, and Google+ to see how we’re growing! This entry was posted on Tuesday, March 10th, 2015	at 11:46 pm	and is filed under Curb Appeal, Lawn Maintenance Service, Lawn Tips	. You can follow any responses to this entry through the RSS 2.0	feed. Both comments and pings are currently closed.